Usually, we review more futuristic products from Scibor Monstrous Miniatures, but recently a large number of interesting fantasy miniatures have emerged. 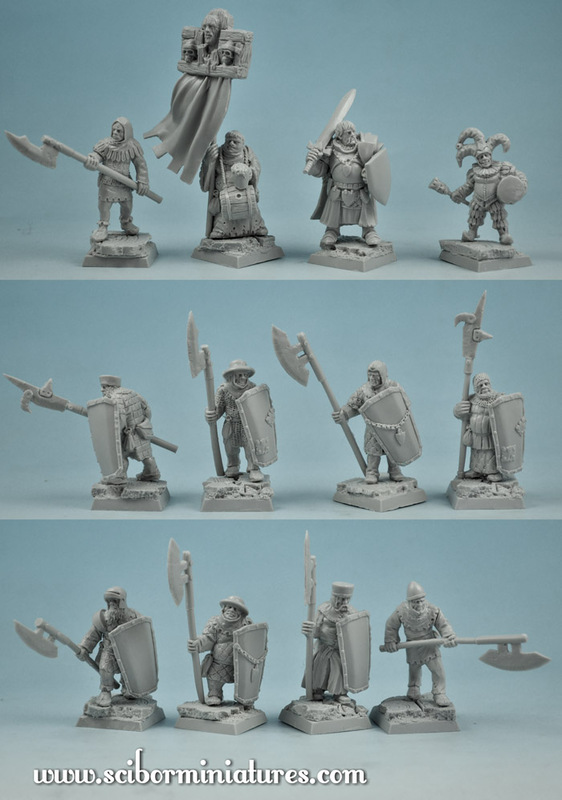 One good example is the Town Guard Miniatures Set. It is a group of twelve resin models which should appeal to most collectors. They should also be of interest to people who are playing Warhammer Fantasy Battle and collectors of Empire army. Each of the twelve miniatures is unique and no pattern is repeated twice, which is a big advantage of those models. Because of the presence of a jester and a monk, we actually have the impression of meeting some merry gathering, not a “war band”. It immediately reminded me of of Robin Hood and Terry’s Pratchett’s Ankh Morpork town guard. Among the twelve miniatures there are nine knights dressed in a variety of ways. Most often we see the quilted long armor or a quilted tunic, long coats of chainmail, and even ordinary clothes, none of the soldiers have any form of more expensive and exclusive armor plate. The level of detail is great, and at the same time the manufacturer maintained a simple and clean style without a lot of unnecessary ornamentation. Even the proportions and age of the individual town guards are different, so we have young and old, with facial hair and without, fat people and thin, full diversity, that’s really good job. In those minis you can see that inspiration was rather historical reality than any kind of fantasy worlds, and for me it’s a plus. The only noticeable drawback is the air bubbles you can sometimes see in the resin (especially noticeable if any bubble is on the miniature’s face ). From the whole Town Guard Miniatures Set the most distinguished are three models. Two of them – a monk and a jester – we already mentioned above the third is a squad leader nobleman knight. The monk reminds me of the Adventures of Roobin Hood and the character of brother Tuck. He is dressed in a hooded monk's robe (the hood is hanging loose on the back). The tip of his head is properly bald and is surrounded by a wreath of hair. There is a wooden flask hanging about his neck (probably full of alcohol). The Jester costume is very original and complex. Buffoons and folds are everywhere. The Comical image is completed by a slim chest vest, a collar around his neck and a clownish hat with bells. The Jester is holding the drum under his left arm and happily hits it with a baton held in his other hand. The Last figure is the nobleman, a knight I suppose, as he is the only one wearing a thicker armor made of steel plates. His face resembles a Polish XVI-XVIII century Sarmat (type of nobleman) with long mustache and distinctive hairstyle popular in those times. In addition to plate armor and parts of visible chainmail, his other characteristic equipment’s parts are a medallion and a long coat rimmed with fur. This warrior is also armed with a sword and a small shield. 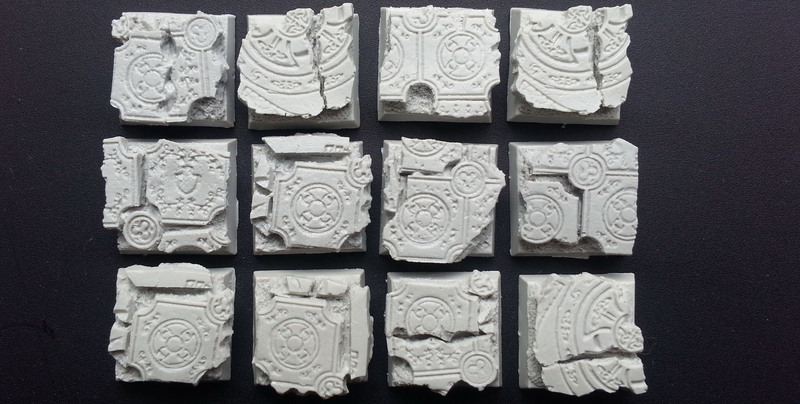 Additionally, each miniature has its own unique square, runic battlebase, resembling a runic marble floor, cracked and damaged by time . 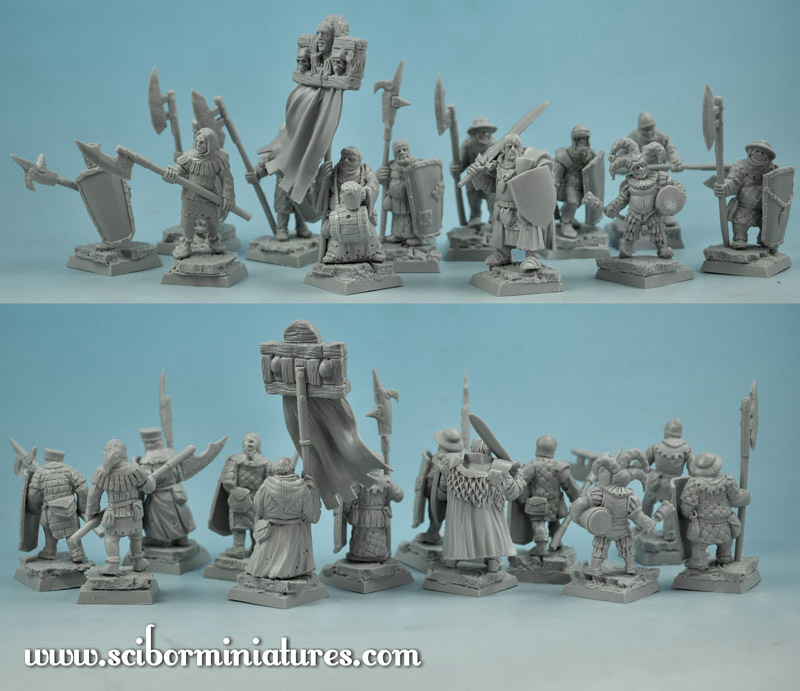 As I saidbefore, all figures are superbly designed and very well made, Even if we find some small errors in the resin, the whole Town Guard Miniatures Set makes a very positive impression. I highly recommend this product. Hahaha, świetni są :D, nie to co nudne figurki GW. Czy będzie z nich może osobna armia, czy to tylko jednorazowe wzory do działu fantasy 28? Nice designs Scibor always been able to surprise me, but I like best the new Elven decorations I hope that in time Scibor or Rene will create Elven sf or fantasy army. Do niedawna nie wiedziałem nawet, że jest taka firma... lol. Przyznaję, mają zarąbiste figurki, dajcie mi tylko $ to kupię chyba wszystkie :).